Mariposa Bakery is a rare independent establishment featuring in house baked pastries and bread with breakfast & lunch made from scratch. We are an independent neighborhood bakery, specializing in unique, satisfying baked goods and food. We’re particularly proud of our scones, a customer favorite since our opening days. From classic orange currant to strawberry oatmeal, blackberry lime and kale parmesan, our unique flavors are sought after at the farmers markets and consistently among our top sellers at the bakery. Everything served at Mariposa is made on site. We use the best quality ingredients, including direct trade coffee and chocolate, hand-crafted, organic teas, and farmer’s market produce. We offer a warm, comfortable space with exposed brick walls and rotating photography exhibits. A quiet oasis away from the busy-ness of Mass Ave. We aim to create a welcoming, comfortable environment that invites you to settle in for a quiet snack or a coffee while you read, connect with good friends, and enjoy a tasty meal. While our menus have changed over these 15 years, we have been anchored by the people who make this work possible, including our dedicated customers, our Central Square neighbors, and especially our staff. Our employees mirror our community, and come from all over Greater Boston and the world ---Jamaica, El Salvador, Sri Lanka, Haiti, South Africa. 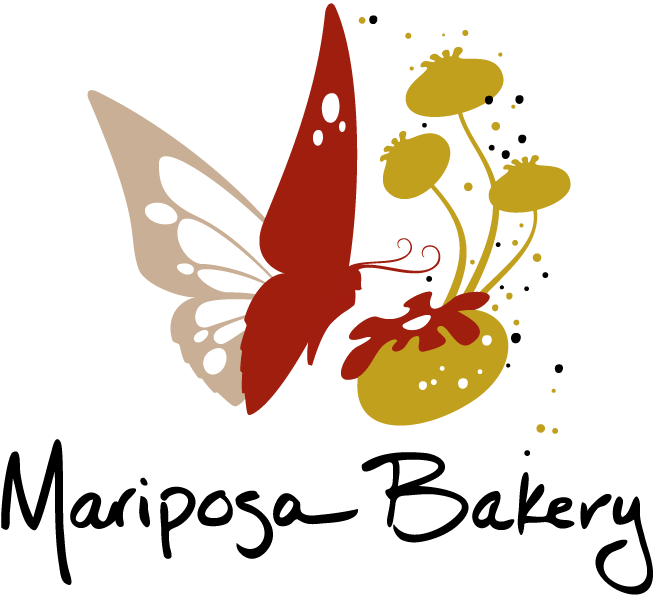 Over the years, their unique voices and talents— as bakers and cooks, illustrators, photographers, chefs, actors, musicians, and more—have shaped what Mariposa is today. Mariposa was founded by Suzanne Mermelstein. Suzanne’s passion for baking grew out of many influences. The daughter of Eastern European immigrants, Suzanne grew up in a close-knit, multigenerational family that celebrated food and came together around cooking, baking, and eating together. She got her professional start as a baker when she moved to Cambridge in 1991 and worked at Panini bakery. Four years later, she went on to Rialto restaurant where she became the lead bread baker and pastry assistant. Over the years, she dreamed of launching her own business. In 2004, Mariposa Bakery opened its doors in Central Square. Suzanne was later joined by former Rialto colleague Petal Joseph, who guides operations and staffing at Mariposa. Together, Suzanne and Petal combine their experiences to lead the day-to-day operations of this thriving small business. Suzanne lives in Prospect Hill in Somerville with her partner Paul O'Connell and their Portuguese water dog, Willa. Paul is the former chef and owner of the award-winning Chez Henri in Cambridge. He has played an active role in Mariposa since its founding. He was part of the original consulting team and continues to collaborate on menu development and manages Mariposa’s Farmer’s Markets operations – and an occasional pop-up.